If you are a beach lover looking for an inexpensive all-inclusive hotel on a great beach, with the opportunity to explore other bars & restaurants outside the complex, then look no further than Club Tropical. The hotel is set on one of Cuba’s most beautiful beaches & guests are always either a few steps from azure blue waters or the fun, colourful Varadero strip. There has been extensive recent renovation at the complex, although it has remained open & popular with guests throughout (a testament to the dedication of the hotel’s staff). 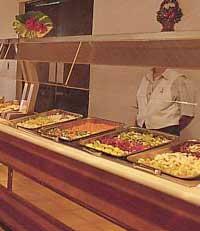 The food & drink served at its restaurant & bars surpasses the standard set by most of Club Tropical’s competitors, with fresh food, canned beers & a good range of liquors. Club Tropical hotel provides a good range of on-site & beach activities, including basketball, volleyball, aerobics, table tennis & billiards; while beach activities include windsurfing, catamarans & pedal boats. There are also activities such as scuba diving, though there is a charge for this. 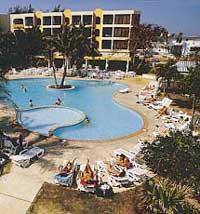 The Tropical pool is a good size, flanked by picturesque palm trees, with a separate shallow area for young children. There are numerous deck chairs & parasols around the pool & there are also chairs & cabanas for shade on the beach. 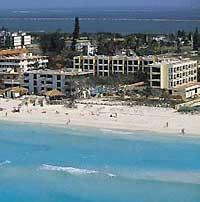 The beautiful beach & great location for exploring Varadero may be the standout considerations for booking this hotel, but you cannot fail to be charmed by the smiling faces & helpfulness of the staff there. This makes hotel Club Tropical the perfect budget all-inclusive Cuban experience. The rooms are all ensuite, comfortable & modern (& likely to be even more so on completion of the renovation work). 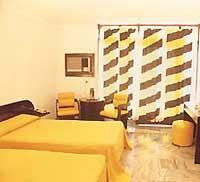 The maids typify the friendly attitude of Club Tropical’s staff & keep the rooms very clean. All rooms have a balcony or terrace, though rooms with sea views should be requested in advance to avoid disappointment.